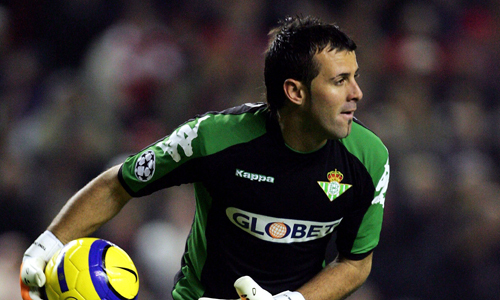 This winter, Toni Doblas, a 37-year-old goalkeeper has moved from Spain to the Philippines, playing for Ceres–Negros. It is not the first time that he has moved abroad - but it might be the last time, in a career that has seen luck very rarely on his side. Born in Seville, Doblas graduated from local Real Betis, and was part of the famous 1999 team that won the juvenil Copa del Rey - a team that also contained future Betis legends like Joaquín, Arzu and Dani. He would spend four seasons with local Real Betis's B-team, where he was the undisputed starter, before moving on loan to Andalusian neighbors Xerez for the 2003-04 season. He made only four appearances in the second division and returned to Betis' first side the year after, being called into immediate main-squad action due to injuries to Pedro Contreras and Toni Prats. He remained a starter for the remainder of the campaign, taking part in the 2005 Copa del Rey final against Osasuna which Betis won 2-1; in the competition's semi-final second leg against Athletic Bilbao he saved two penalties in a shootout and, in August 2005 he signed his first professional contract, at 25. And Doblas was also a key element in Betis' first-ever qualification to the Champions League, as he saved a Camel Meriem penalty against Monaco in the third qualify round, a 3-2 win. But that is where his luck more or less runs out. During the league season errors cost him his position, regained by Contreras: his most notable mistake came against Chelsea at Stamford Bridge, when he gave Ricardo Carvalho a goal in an eventual 0-4 Champions League loss; he still managed 24 league appearances, a situation repeated (also with Contreras as backup) in the 2006-07 campaign. And then, midway through 2007-08, Doblas suffered a serious injury in a friendly that kept him out of action for five months - he was supposed to battle for first-choice status with new signing Ricardo. He was reinstated in the squad in late April, donning the number 25 shirt after teammate Rafael Sobis switched to 21; this led to his release by Betis in June 2008 and in September he joined second level side Real Zaragoza, meeting the same fate at the end of the season. In September 2009, Doblas was supposed to sign for Aris Thessaloniki in Greece for one year, joining a squad with three other countrymen and with Donato - who played in Spain for 15 years - as assistant manager; eventually, the deal fell through and he returned to Spain, moving to Huesca in early November. After regaining his confidence as a started, Doblas returned to Zaragoza on in July 2010, signing a two-year deal with an option to a third season. In the following off-season, after having shared first-choice duties with Leo Franco as the club narrowly avoided top level relegation, he was loaned to another former club, Xerez. Coming back to Zaragoza for the 2012-13 campaign, he found himself relegated to third-choice behind Roberto Jiménez Gago and Leo Franco, and in January 2013, Doblas signed an 18-month contract with Azerbaijan Premier League side Khazar Lankaran. However, six months later, following an 0-8 home defeat to Maccabi Haifa in the Europa League's second qualifying round, he was one of four players to have their contracts terminated. Without a club for almost six months, in February 2014, Doblas moved to Serie A's Napoli for four months, as the Rafael Benítez-led team had several problems in the goalkeeper position, most notably Rafael Cabral who suffered a season-ending injury. After playing just two games - and only one of them as a starter, the other as a substitute for compatriot Pepe Reina - he switched clubs and countries again, and in August 2014 signed with HJK Helsinki as a short-term replacement for Michael Tørnes. Since then, his career has been a series of half-season spells with various clubs around the world. After a brief spell back in his country with lowly Cornellà (2015), he signed for Indian Super League franchise Delhi Dynamos in the summer of 2015. He would go on to play for Toledo (2016), Delhi Dynamos (2016) again, Extremadura (2017) and San Fernando (2017). And he still isn't done saving teams that have injured goalkeepers. Roland Müller's injury at Ceres forced them to find cover and sign a player perfect for the job.